REI Services for the Installation of Sidewalks, Adjacent Curbs, and Pedestrian Ramps – KC Engineering and Land Surveying, P.C. KC provided resident engineering inspection services for this NYCDDC Citywide Emergency Time and Material contract. This project involved the replacement of storm-damaged sidewalks, emergency collapsed sidewalks, and deteriorated sidewalks for which notices of violation had been issued. 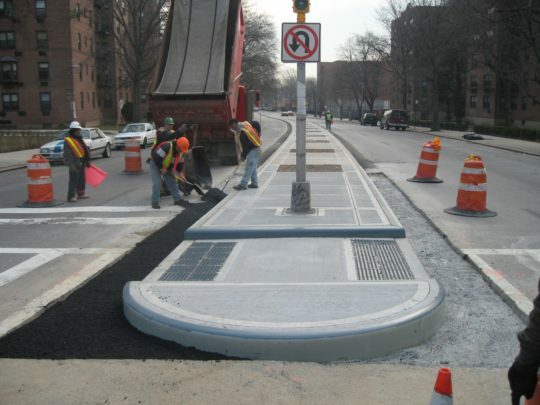 Work included curb replacement (concrete, steel-faced, or granite), concrete and bluestone sidewalk, MPT, tree pruning, base concrete and wearing course, installing and resetting hydrant fenders, and modifying existing catch basins.